Versant Medical Physics & Radiation Safety is growing! The leadership team is always looking for talented individuals to join our team or partner with us. We’re interested in people who share our company values of professionalism, integrity, and a high regard for delivering quality. 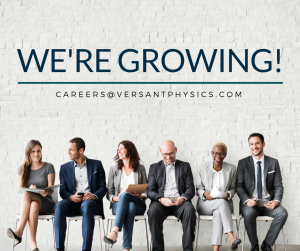 If you are a Medical Physicist or a Radiation Safety professional in North America who is interested in starting a conversation with a company with a bright future, we would love to hear from you at careers@versantphysics.com. Headquartered in Kalamazoo, MI, Versant Physics provides exceptional quality consulting services to health care providers. Our mission is to produce highly accurate, efficient results to ultimately improve the quality of our clients’ and their patients’ lives. Specialty areas of emphasis include radiation safety, radiation program design and management, personnel dosimetry management, equipment commissioning, accreditation, and clinical coverage. In addition to our consulting services, Versant Physics offers a comprehensive software suite, ODYSSEY, which provides modules to assist centers with radiation safety duties, training, badge management and regulatory compliance.